Over-run by these things, faced with thousand of furious neighbours demanding an end to the onslaught, and spiralling power costs, Poland has mounted an enormous about face: where the wind industry was the flavour of the month for a year or two, it’s just been hit with the first salvo in an effort to give Poles back a little peace and quiet. Like the Bavarians, the Poles have determined to put some distance between these things and houses: 10 times the height, which, with turbine tips topping 160m, means a gap of 1.6km or more. That, of course, is nowhere near enough to protect humans; or anything else that lives and breathes, for that matter (see our post here). However, in closely populated territory, like Poland and Bavaria, a setback of 1.6-2km has the practical effect of scuttling plenty of proposed developments. To make them anything like economically feasible (well, OK, only by way of massive subsidies) they need to be slung up in sizeable clusters, so as to minimise the cost of connecting them to a common substation and, from there, the grid. 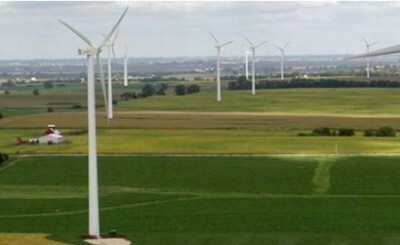 In the following piece, stopwiatrakom.eu details the new rules, but has yet to grasp the significance of preventing wind farm configurations that, until now, have seen these things quite literally speared into Polish backyards. 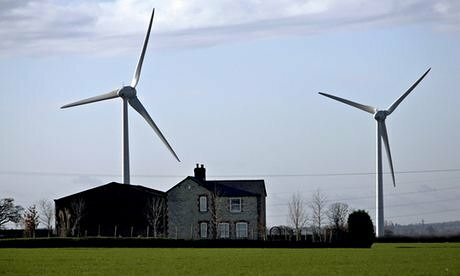 With houses dotted all over the countryside, planned turbine sitings will naturally run into residential ‘obstacles’ in all directions. Making 30 or more fit in between those dots will be about as plausible as passing a camel through the eye of a needle. the law transfers the authority to issue environmental permits from municipal authorities to regional government agencies specialising in environmental protection issues (Regional Environmental Protection Directors). It needs to be noted that this legislation does not provide for the liquidation of any existing wind farms, does not affect in any way the current operation of these plants or the public subsidy system for industrial wind energy. A recent report by the Polish National Auditor (NIK) analysed the failure to safeguard the public interest in local planning and approval processes for wind farms. Based on a multiyear inquiry covering 70 local and county level authorities, the report identified massive conflicts of interest (wind farms being sited on lands owned by local officials approving the projects), other widespread violation of local government laws, the lack of proper measurement of sound emissions from wind farms, and failures to properly consult with local communities about the projects. The Polish Public Health Institute (PIZP-PZH) issued a recommendation that wind farms should be located at least 2 kilometres from people’s residences, citing a comprehensive review of current scientific publications (close to 500 items) and the precautionary principle that is part of the EU law. Poland’s Government says ‘time to place these things and Poles apart’. It would appear that your Facebook link system has developed a glitch as they are no longer appearing on the chosen FB page! All appears to be working at our end. Perhaps you may have inadvertently blocked STT?